Fuel up with Hemp! Fast Fuel Endurance Bars are now available in certified organic as well as all-natural. Choose from Chocolate Crunch, Chocolate Espresso and coming soon: Apple Caramel. A Natural Emphasis product. With this issue of The Hemp Report, we have sought to profile some of the many new (and perhaps overlooked products) that have hit the shelves this year. Admittedly, a few of this products have been available earlier than 2002, so we are making up for lost time. If you are not listed here, and think you should be, please email us at: arthurhanks@hempreport.com ... and let us know some more about you. HEMP-START is an organic seed coating which acts as a rhizosphere regulator to aid germination and emergence. HEMP-START is a must to help get your crop off to a healthy start. HEMP-START is a 100% natural product available in a dry form that contains no synthetic derivatives. 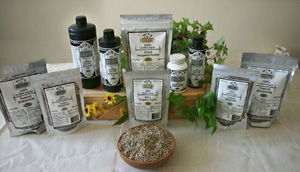 Safe and easy to use on all hempseeds. Hemp-Start meets all certification standards for crops certified Organically Grown. BioHemp Environmental Technologies has entered a new era! Having developed, built up, and sold a successful line of health food hemp products, BioHemp is ready for the "industrial" hemp industry. Our first product uses industrial hemp oil grown and processed on the Prairies. 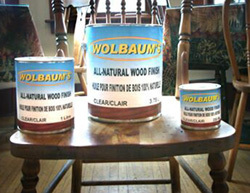 Our Wolbaum's All-Natural Wood Finish offers customers an all-natural, non-toxic alternative for their wood finishing needs. Besides testing, marketing, and planning our first production run, we are also investigating the formation of a New-Generation Co-operative to supply our hemp oil needs and include all levels, from producer to marketer in the value-added chain. It's the coolest Delicious n' Nutritious Taste Sensation. Cool Hemp is the non-dairy frozen dessert made form delicious nutritious hempseeds. Available in three classic flavours - Cool Chocolate, Cool Vanilla and Cool Maple. Cool Hemp is certified Organic and certified kosher, and is made using the finest quality certified organic, locally grown and fairy traded ingredients available. Dehulled Canadian hempseeds, Canadian Maple syrup, vanilla bean, all natural gums, sea salt, fair trade organic unrefined cocoa and fair trade sugar. Cool Hemp uses dehulled hempseeds which are nutrient rich. Traditional ways, Today's products: Canolio introduces Hemp Coffee, a blend of carefully selected Columbian coffee and organic hempseed that is rich in taste, with a light nutty flavor. Hempseed is also a source of Omega 3 and Omega 6 EFA's (anti-oxidants), which have numerous health benefits, making Canolio Hemp Coffee a good alternative to regular coffee. Eclectic Cosmetics Inc. of Regina Saskatchewan recently launched their first line of all natural bodycare products called Moist Hemp. The line was launched with six luxurious cleansing bars which all contain 30% certified organic hempseed oil, and all natural ingredients including fragrances and colorants which are created from only pure essential oils and plant based extracts, roots, and seeds. Partners Martine Carlina, Chris Lobb, and Carla Loiselle all have the common belief that what touches your skin should be as important as what you eat. 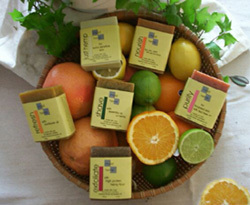 Eclectic Cosmetics Inc. is now development stage of three new bodycare products due to be launched in May of 2002. HMG distributes Moist Hemp which was launched in November of 2001 to over fifty natural product retailers in Canada. gen-why is a high performance art project. Manifestation requires participation. If you don't get it, don't be mad. it's a good thing. If you do get it, get in the game. 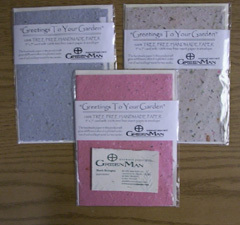 Greetings To Your Garden, handmade paper cards that will sprout and grow wildflowers when planted! Mail somebody a card, they grow a garden! Cards are made by carefully recycling old office grade scrap paper; special attention is made to ensure seed. Once planted and kept moist it will sprout within days. Each card comes individually packaged and bundled in dozens. Minimum order is 12 cards and there are three different colours available. (Blue, Pink and Brown(ish). 2002 just got a whole lot healthier. HEMPFOOD.CA will be releasing a new line of hemp muffin and cookie mixes. Certified Organic and Proudly Canadian. HEMPFOOD.CA functional hemp foods are designed to do two things for you; benefit your health and benefit our planet. Our mission is to achieve global health and well being with every decision we make. Our experience has proven that hemp foods are the answer to achieving the balance we seek on the planet between health, harmony and feeling good. Our products are the realization of that quest. At HEMPFOOD.CA your health and your environment come first - always. HempWood. A pure, natural and safe finishing oil, primarily used for different wood applications, performs well as a lacquer on other surfaces like metal and painted materials. Enriches and protects wood grains. Wheat-free pancake mix, each serving provides 25 grams of protein... more than the average protein-rich nutrition bar on the market today! And, co-branded with Embassy Food Specialties Ltd.,: HEMPOLA breads, pancake mix and brownie mix. salt scrub and a light, silky, hemp based hand lotion. All made by hand in small batches, using highest quality ingredients. Oh Baby!!! Hemptown is pleased to unveil our newest product: Infant Hemptown T-shirts! Perfect for newborn to 12 months, available with the cheeky screen print slogan: "Who did you THINK you were saving the planet for?" You should begin finding these delightful items in Hospital shops, card and florist shops, baby wear stores and anywhere else that gifts for newborns might be found. Available online or contact us at 1- 866-HEMPTOWN for wholesale quantities. HMG has now extended its repertoire of hemp food distribution to include eleven products under the Mum's Original Brand name which include hempseed oil, hulled hempseed protein, toasted tamari style seeds, toasted hempseeds with sea salt. 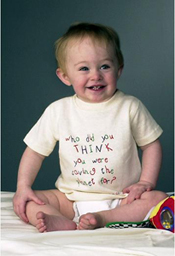 Mum's Original was launched in April of 2000 with three products. In the past year Mum's line has grown exponentially due to greater consumer awareness of hemp food and its benefits. Mum's Original is now distributed directly to over 350 natural product retailers in North America. President Martine Carlina credits this growth to HMG's expertise in marketing through regional natural products representatives, its in-store demonstration program, and continued attention to natural products retailers needs. Manitoba Harvest ; Hemp Seed Nut Butter is one of nature's richest sources of complete protein (35%), Omega 6 & Omega 3 Essential Fatty Acids (35%) and is a source of GLA (1%). Manitoba Harvest ; Hemp Seed Nut Butter is a wonderful spread for breads, bagels, crackers and croissants. Hemp Seed Nut Butter can be combined with herbs and spices to create delicious pates and dips & is a delicious addition to smoothies, sauces and baking. You can substitute Hemp Seed Nut Butter for other nut butters in any recipe. Made from 100% shelled hemp seed. Packaged without additives or preservatives and grown without herbicides or pesticides from Non-Genetically Modified Hemp Seed. I have T-shirts made up with Dauphin, Manitoba Industrial Hemp Capital Of Canada across the front. It also shows a big hemp leaf. I also have golf shirts with the Parkland logo (Alb.Sask.Man.) on the front. The T-shirts sell for $16.00 & the golf shirts for $22.00. J Mulligan, RR#2 Comp 35, Dauphin Man. R7N 2T5, Tel: (204) 638-4816, email: dive@mb.sympatico.ca. Natural Emphasis is proud to announce the recent introduction of FUEL - a delicious range of Natural Endurance Bars made with THC-free dehulled hemp seed. Fuel Bars are now available in three convenient formats: Fast Fuel Natural, Fast Fuel Certified Organic and bite sized Fun Fuel. All three formats are also available in three fantastic flavours: Chocolate Crunch, Chocolate Espresso and Apple Caramel. Hemp, a member of the bast family of fibres, is flourishing in popularity and causing a stir. Yields naturally beautiful fabrics that are durable and resistant. Inspired by the environmental craze, Quebectex is taking this fibre one step further with the help of the experts of knit hemp fabrics. Taking the "crude" from Hemp and applying it to the "cultured" of our Velours and Terries has broken down the barriers creating a dramatic alliance; Beauty and the Beast. Solid and Jacquard designs are now made available in environmentally friendly and recycled fibres, ideal for home furnishings and all those in the garment industry with a conscientious and lucrative vision of the future. Hundreds of items of hemp and organic cotton clothing. 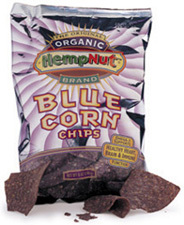 January 2000: Launched a line with hemp tortilla chips. (Original, Spicy Cheddar, Chili Lime). March 2000: Hemp pasta with/without wheat. Conventional hemp oil. Certified organic hemp/flax blend. September 2000: Hemp salad dressings (Balsamic, Hemp & Honey Mustard, Far East). February 2001: New packaging on chips to double shelf life. September 2000: Launched more Bars (Java and Mocha), withdrew hemp/flax blend. March 2002: Launched certified organic Hemp Oil, launched certified organic shelled hempseed under own trade name, SoftHemp. Launched bars made with SoftHemp. Launched hemp & wholewheat wraps. Ruth's Hemp Foods, Box 73, Stn. 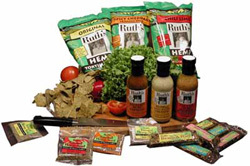 P, Toronto, Ontario, Canada, M5S 2P6 Tel: (416) 588-4209, Fax: (416) 588-4210, email: info@ruthsfoods.ca, Web: www.ruthsfoods.ca. Wellington Polymer Technology Inc. (WPTI) of Chatham Ontario has successfully integrated reclaimable agricultural fibres with post-industrial plastic bio-products in the composition of the EnviroShake - a simulated cedar shake roof covering. The EnviroShake offers many advantages over conventional wood products due to the strength, durability, and other inherent physical properties of the WPTI composite material. The final product replicates the look of an antique cedar roof when installed, but will not require treatments or any maintenance, will not warp or crack, and will offer added durability compared to conventional shakes. Hemp Report Kudo: Wellington Polymer Technology was the 2001 recipient of the Canadian Agri-Food Award of Excellence for Innovation. AFAC Minister Lyle Vanclief presented the award to WPTI on Monday November 05, at The Royal Winter Fair's President's Luncheon in Toronto. Congratulations. Tel: toll free 1-866-423-3302., email: info@enviroshake.com, Web: www.enviroshake.com. BioHemp Environmental Technologies has entered a new era! Having developed, built up, and sold a successful line of health food hemp products, BioHemp is ready for the "industrial" hemp industry. Our first product uses industrial hemp oil grown and processed on the Prairies. Our Wolbaum's All-Natural Wood Finish offers customers an all-natural, non-toxic alternative for their wood finishing needs. A great snack for any kind of sports activity! •Gluten Free • Wheat Free • No Refined Sugar • No Preservatives • No Stabilizers • No Salt Added • Low in Fat • Kosher • Natural Ingredients • No Milk or Eggs. Alpsnack Snacks are produced by Mrs. Denson's Cookie Co.
RENEWING SALT SCRUB, Part of our Skin Nutrients collection. Refreshes and revitalizes skin. A blend of mineral-rich Dead Sea salts, hemp seed oil and vitamin C maximizes exfoliation while moisturizing skin. 12 oz. Made in USA. Men's Wearhouse, a chain of retail stores, now carries hemp pants produced by Chi Wear. The organic cotton and hemp clothing company. It might not be too late to order! The HIA 2002 Hemp Calendar is the first of it's kind and will become a collector's item. It includes relevant Hemp Dates throughout the year, lots of information and a variety of Hemp Photos...all printed on Hemp & Recycled Paper from Living Tree Paper Company. Buy one for yourself or a dozen for gifts or two dozen for your store or business. Support the Hemp Industries Association...support renewable and sustainable resources. Donations go to the Hemp Industries Association to help educate and expand the market. Organic Blue Corn Chips -- this is the coolest chip on the planet: third-party certified 95% organic (including the oil, most just use organic corn), certified kosher (Kof-K), vegan, high in omega-3, blue corn means never any Genetically-Modified Organisms (unlike yellow corn chips), healthier organic high-oleic sunflower and/or safflower oils are used, and packed in a metal Mylar bag to protect the omega-3 fatty acid and to prevent rancidity. Unlike plastic bags, Mylar keeps oxygen from getting into the bag and causing rancidity, plus we flush the bag of oxygen with inert nitrogen gas. This is the best package we can find for these chips. This product helps support healthy heart, brain, lung, and immune function. And not only are they super healthy, they taste great! This is perhaps the most organic chip on the market, the healthiest, and certainly contending for the honor of tastiest as well! Tel: (Toll-free; USA) at 1-877-HEMPNUT. Web: www.TheHempNut.com or The HempNut General Store at: www.store.yahoo.com/hempnut. Conventional plastic is not biodegradable. This means that our landfills will grow and grow. Plastic materials are also based on a finite resource that will not be available to future generations. We are proud to introduce the first 100% hemp (no resins, binders, or glue) instruments Buy a Hemp Didgeridoo! Tel: +44 (0)7050 600 418, Fax: +44 (0)7050 600 419, email: plastic@hempplastic.com, Web: http://www.hempplastic.com. HempTrends, Inc. In Manitou Springs, CO is announcing the international release of our exceptional hemp personal care line later this spring! HempTrends Soaps and Lotions all have a 30% hemp oil content. They are available in seven matching scents. The entire line is completely natural, using only ingredients your body needs, and nothing it doesn't. HempTrends will also release a very user friendly exfoliating scrub, a night cream, and is now developing hair and lip care. Trend Center GmbH. HempWorld, Inc. has acquired the exclusive right to market Trend Center Hemp and Cannabis Candy for North America. Trend Center has a unique manufacturing process with highly advanced techniques to produce delicious Hemp and Cannabis Candy, completely THC-free. This natural and zesty flavor is what Hemp and Cannabis aficionados crave for when they think of their favorite plant. Producing the Candy in bulk and shipping directly to the distribution center of HempWorld in the US from Germany, gives an advantage in scale and increased efficiency, which is ultimately passed on to the consumer in the form of lower prices and faster delivery. HempWorld, Inc. (USA) Matthew Huijgen, Tel: 805-448-8081, email:Matthew@HempWorld.com, Trend Center GMBH, Roland Biniossek, Tel: + 49-7731-83-84-80, email: mailto@trendcenter-online.de. All are available directly to the public on the Web at: www.CannabisCandy.com. This book combines a useful review of the hemp pest and disease literature published over the past 50 years, with up-to-date information on modern biological control techniques. Each pest and disease organism is presented in the same format, covering range and economic impact, symptoms, life history, diagnosis, and both new and old techniques for biological control and chemical control. Easy to use keys are included for rapid identification of the most common pests. Introductory chapters describe the general principles of plant protection, requirements for healthy plant growth, and taxonomy of parasites and pathogens. Published by the UK's CABI publishing, www.cabi-publishing.org/, as well as Oxford University Press, www.oup-usa.org. 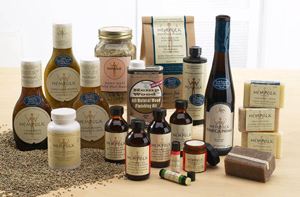 Natural Products that use nature as a primary ingredient. Now starting to incorporate hemp into some of their formulas. Consumers will be able to celebrate Earth Day 2002 at more than 1,000 Staples Superstores across the country by purchasing reams of newly-stocked Vanguard Recycled Plus, a 90% post-consumer waste, 10% nonwood paper manufactured by Living Tree Paper Company (Eugene, Oregon). Expected to sell at a price point of $6.99 (US), the versatile sheet is guaranteed for use in ink-jet printers, laser printers, and copiers and makes a beautiful business stationery. Vanguard Recycled Plus is made from recycled office paper and Hemp/Flax, a combination of hemp and flax fibers. The 24# premium white bond paper is acid free and process-chlorine free, and the Hemp/Flax portion is totally chlorine tree. Carolyn Moran, Living Tree Paper Company, Tel: 1-800-309-2974; email: info@livingtreepaper.com,, Web: www.livingtreepaper.com. Nutiva is proud to add two new organic bars: our Flax Chocolate, made with real chocolate, rice crisps, honey, and the nutritious seeds of flax, sesame, and sunflower; and our HempDate, which includes seeds of hemp, sesame, and flax plus date pieces and honey. The Flax Chocolate bar is 97% certified organic and the Hemp Date bar is 100% certified organic. (The lecithin in the Flax Chocolate bar is not organic; we are working to source the first organic lecithin in mid-2002.) The two new bars add to Nutiva's current bar lineup of the Original Organic Hempseed Bar and the Organic Flax Raisin Bar. The company's products are certified organic by QAI. Contact Nutiva president John W. Roulac at john@nutiva.com, Tel: 1-800-993-4367, Ext. 201, or visit www.nutiva.com. New magazine going boldly where others have gone before...worth a look. Feature Plug: Return of the JIHA. Journal of Industrial Hemp: Production, Processing and Products. For many years, the Journal of the Industrial Hemp Association (JIHA) served as the canon of knowledge for researchers and enthusiasts of industrial hemp. Now reborn as the Journal of Industrial Hemp, and published stateside by the Haworth Press, the JIH aims to keep its core content of peer reviewed core papers while adding practical information. What made the old JIHA particularly interesting to me - besides, of course, its focus on industrial hemp - was that it was a multicultural and multidisciplinary serving of human knowledge. History, biology, agronomy, mechanical engineering, language, ecology, commerce and more were all part of the oeuvre. The journal was a great read and now after some 2 years off, its back. Because of its narrow (hemp) / broad (M and M) focus, the new JIH will become important reading for anyone working with industrial hemp today. Now, as big chunks of the journal is technical and specialised, it might be a tough read for those not versed in a postgraduate discipline. But any thinking/learning/breathing reader should be drawn in, whether by Mandolino's and Ranalli's paper on hemp molecular biology and breeding markers, Dreyer and Co. on enzymatic fibre separation or John McPartland (Hemp Pests and Diseases) paper on the hemp borer as founding in the stand of New England feral hemp. The journal also offers a selection of popular (i.e. : non-peer reviewed) papers. These are very good and are not dumbed down. Jan Bojet's Vindheim's History of Hemp in Norway is a rich read; Jace Callaway's "Hemp as Food at High Latitudes" taught me a few more things about fats; Karus and Kaup on "Natural Fibres in the automotive industry" is very informative. Also nice to see Marc Deeley's paper on climate change and cannabis again. There's lots more inside, but I think in general that most readers will find the popular papers to have the best value. Also invaluable from a North American perspective, is that almost all the journal's content is from Europe. We really need more access to what's going on "over the water", even in this day of modems and fibre optic cables. Hopefully the existence of the journal will spur on research and contributions from Canada and stateside. The Saskatchewan Hemp Association is a vertically- integrated association of growers, processors and marketers in Saskatchewan and from across western Canada. We are pleased to announce the appointment of The Hemp Report's Arthur Hanks as office manager for 2002. He will be working closely with Duane Phillippi, Executive Director in member services and in SHA special projects. To go to Part II, Marketing, click here.